Students at Greenwood Elementary School planting Eastern Redbud seedlings. Each year, the dark pink blossoms of the Eastern Redbud tree are one of the first signs of spring. This tree is native to Virginia, meaning that it will flourish in neighborhoods, parks and along roadways throughout the Commonwealth. Redbuds also thrive in other states, making it the ideal selection for the free tree seedlings that are given to all participating students in Dominion Energy’s Project Plant It! program. Project Plant It!, Dominion Energy’s springtime environmental education and tree-planting program, was established in 2007 and has branched out to all of the states where the company conducts business. Teachers and group leaders register for tree seedlings in the fall. The seedlings are cultivated by the Arbor Day Foundation and about 70,000 seedlings will be shipped to participants in time to celebrate Arbor Day, which falls on April 26, 2019. Now in its 13th year, Project Plant It! has distributed about 570,000 seedlings since 2007. According to experts from the Virginia Department of Forestry, that equates to about 1,425 acres of new forest if all the trees are planted and grow to maturity. A newly-refreshed website, projectplantit.com, highlights the educator resources and lesson plans that can be downloaded at no charge. Three new educational games showcasing cool tree trivia are now on the website for grade levels K-4, 5-8, and 9-12. These games are perfect for rainy day fun when kids can’t go outside. The website also includes a number of instructional tools, including an Educator’s Classroom Guide with 12 lesson plans that support third-grade learning standards for math, science, language arts and social studies. All of the lesson plans can be adapted easily for all ages and grade levels of students. 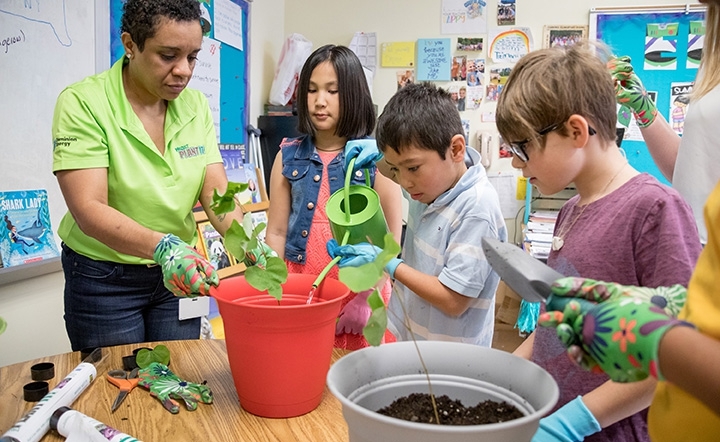 Creative educators like Rebecca Musso, a science teacher at T. Benton Gayle Middle School in Stafford County, Va., are using the redbud seedlings to teach students about environmental sustainability, especially when the redbud seedlings are planted in areas to prevent soil erosion. For more information, visit Project Plant It!’s Facebook page or website.